1 b&w; interior scene of a dance. 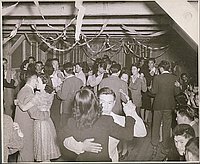 Couples of young adults dancing in a room while others sit on the side looking on. Streamers decorate the ceiling. Background to the R hangs an American flag.